Present state: Up platform extant. Part of down platform by signal box extant and in use. Notes: Once the temporary station at Folkestone opened on 28 June 1843 work to complete Sir William Cubitt's 19-arch Foord viaduct progressed rapidly with the permanent station at Folkestone expected to be open by the late autumn. This was, however, delayed fallowing a serious landslip on the massive embankment between the station and the viaduct. The viaduct was finally completed on 20 November 1843 with the first locomotive running over it the following day with a series of trials taking place three weeks later. On 14 December a special train carried the SER's board of directors over the viaduct and into the new Folkestone station. On Monday 18 September the temporary station closed with trains being extended into the new terminus which was sited at the rear of the town on the east side. Folkestone station had two staggered platforms with passengers crossing the line on a boarded crossing; these were favoured by the SER although the Board of Trade considered them dangerous for passengers. Footbridges were eventually provided. A range of single-storey buildings was provided on both platforms with the main station entrance on the up side at the end of what later became Station Approach. A small timber signal box was later provided at the east end of the down platform; this replaced an earlier box at the junction with the line to Folkestone Harbour. Two back-to-back single-road brick engine sheds were built on the up side opposite the east end of the down platform; they opened on 18 December 1843. The station had a small goods yard on the down side opposite the staggered up platform; this included a small through goods shed and a crane. A number of short sidings fanned out at right angles to the main line. These were connected to a turnplate with a line crossing the main line at right angles to another turnplate and a small two-road carriage shed on the up side. Extensive coke ovens were provided between the main line and the harbour branch. Early steam locomotives in the UK used coke as fuel, instead of coal, because of an early legal requirement that locomotives should 'consume their own smoke'. Coal produces smoke when burned whereas coke burns almost smoke-free. Coke is created by heating soft coal in an airtight oven. As it heats, the coal decomposes to give a hard, porous, greyish substance, and this coke contains almost 90% carbon. When it burns, coke produces intense, smokeless heat. Although the line had not yet reached the ferries at Dover - and passengers had to make the final leg of their journey in horse-drawn vehicles - the popularity of the new route far exceeded expectations. With the completion of SER's Folkestone Harbour, a ferry service between there and Boulogne was launched on 2 August 1843, and within five months of Folkestone station opening 20,000 people had made the crossing. Folkestone station was well laid out and popular with travellers, and every train was met by horse-drawn carriages ready to take passengers to Dover or Folkestone where steam ferries arrived and departed with every tide. This was a busy period for Folkestone station which now handled all traffic for the town and the harbour. The station was served by eight trains a day in each direction with the fastest journey time to London taking 3 hours and 5 minutes at an average speed of 29.6 mph. To the north of the station the SER built a branch line to the harbour, but this had no direct connection with the main line. Instead it trailed into exchange sidings close to the station requiring a reversal in order to reach the main line. This was a safety requirement as the steeply-graded harbour branch descended at 1 in 30 for three quarters of a mile. While the Folkestone Harbour branch would be restricted to goods traffic until 1849 the extension to Dover was quickly completed, and on 7 February 1844 Folkestone was no longer a terminus when the first public train left the station bound for Dover. It had always been the intention of the SER to concentrate its ferry services on Folkestone rather than Dover. April 1848 saw the opening of the Boulogne & Amiens Railway which made the completion of the Folkestone Harbour branch imperative. Once numerous improvements required by the Board of Trade had been completed, the branch finally opened to the public as far as the pier on 1 January 1849; at this time passengers still had to walk across the swing bridge to reach the ferries. They also had to change trains at Folkestone for the short journey to the Harbour but, not surprisingly, this was unpopular. In July 1849 Folkestone station was renamed Folkestone Old. Two years after the Folkestone Harbour branch opened the name was once again changed to Folkestone Junction in January 1850. With the opening of the station at Folkestone Harbour, Folkestone Junction lost much of its traffic: not only the boat train traffic but some of the town traffic as well. This was further eroded with the opening of Shorncliffe Camp station on the west side of the town on 1 November 1863. In 1884 the London Chatham & Dover Railway (LC&DR), the arch rival of the SER, was determined to reach Folkestone, reviving an earlier proposal to build a double-track line along the Alkham Valley from Kearsney, on its Canterbury to Dover line, to a new terminus at Folkestone from where it hoped to reach London by paralleling the SER. A Bill was prepared to put before Parliament in 1884. In an attempt to block this new, financially damaging route, the SER revived its Elham Valley line. The SER was anxious secure the goodwill of the people of Folkestone. Folkestone Junction station was inconveniently located on the east side of the town so when the SER received a request for a more centrally sited station, the SER chairman Sir Edward Watkin gave his personal assurance that the request would be investigated. The SER was keen to win local support in an attempt to block the LD&DR. Although the Alkham Valley scheme was eventually dropped and the Elham Valley line was built, Folkestone did receive its central station. A site was quickly chosen on the west of Cheriton Road and construction began immediately and progressed rapidly. The planned name was Cheriton Road but when the station opened on 18 August 1884 it was called Cheriton Arch after the narrow brick arch that carried the railway over the road. In September 1886 the name was changed to Radnor Park at a time when a large area of adjacent land had been gifted to the town by Lord Radnor. The station became Folkestone Central on 1 June 1895. 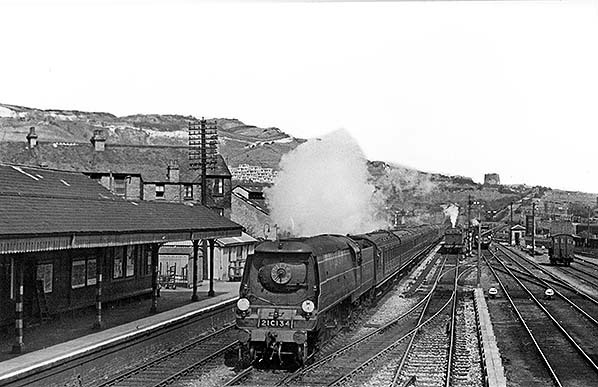 Folkestone Central was soon the principal passenger station for the town with goods traffic being concentrated at Folkestone Junction. Extensive new goods facilities were provided there on the site of the old coking ovens. These had been taken out of use in the 1880s once coal-burning had been perfected. A private siding on the up side, immediately north of the junction with the harbour branch, served a canning manufactory. By the first decade of the twentieth century the same siding served a corporation depot with a refuse destructor. 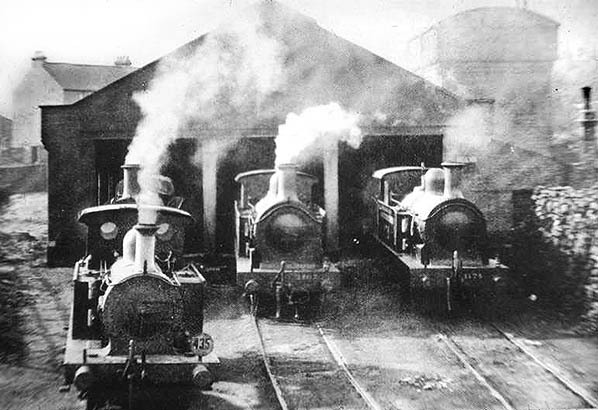 In 1900 a new 3-road engine shed with a water tank on a brick base to the rear was provided on the down side behind the signal box; the two earlier sheds were closed at the same time. A number of locomotives were kept here primarily for help with the 1 in 30 incline on the harbour branch. A 65ft turntable was added alongside the shed in 1918. At the turn of the century the scene at Folkestone junction was one of incessant activity. The Harbour branch remained busy with the passenger and goods trains which had to be hauled up the tortuous incline to the exchange sidings. In 1908 the small wooden signal box at the east end of the down platform at Folkestone Junction was replaced with a much larger box on a brick base. The 1907 Ordnance Survey map (reproduced below) shows goods facilities on both sides of the line. 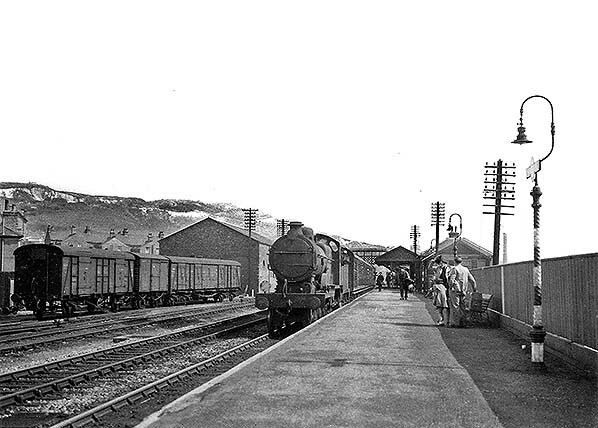 The main goods yard which comprised a long through goods shed, cattle dock and pens and a coal depot was located to the south of the station between the main line and the harbour branch. The original goods yard was retained with further sidings, a second goods shed and a 4-ton capacity crane on the down side opposite the staggered up platform. The exchange sidings for the harbour branch were provided between the south side yard and the up line. During WW1, a landslide on 19 December 1915 resulted in the entire undercliff supporting the main line at Folkestone Warren moving towards the sea blocking a mile of track between the Martello and Abbotscliffe tunnels. After consultation with the Board of Trade the SE&CR decided that the blockage could not be removed during the War. The Junction station once again became a terminus. The reopening of the railway between Dover and Folkestone took place on 11 August 1919, the line having been reconstructed during the spring and early summer. At this time a new signal box was opened at Folkestone Junction on the up side of the Dover end of Martello tunnel. This became Folkestone B with the earlier box now known as Folkestone A. After the grouping on 1 January 1923, Folkestone Junction came under the control of the Southern Railway and the station was painted in the smart dark green, buff and white of the new company, whilst a vivid and colourful array of posters covered the walls, advertising tempting holidays in Britain to places as far away as Scotland, Devon and Cornwall. On 22 June 1930 Folkestone Junction B signal box was closed after only 11 years’ service, with control of its four signals being transferred to the A box. During WW2, a number of high explosive bombs fell near the junction station, but damage was limited to nearby houses. 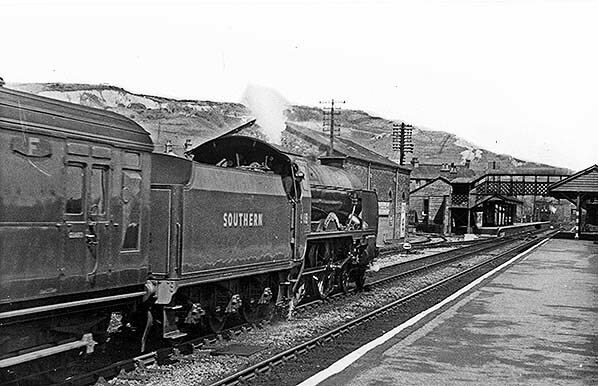 In 1960 both platforms were extended at opposite ends as part of Stage 2 of the Kent Coast Electrification which included both the main line and the harbour branch. For the first time the two platforms faced each other. Colour light signalling was also installed and a new signal box was provided at the rear of the down platform controlling movements between Ashford and Dover Archcliffe Junction. Folkestone shed closed on 12 June 1961 following electrification. In September 1962 Shorncliffe was renamed Folkestone West, whilst the junction station became Folkestone East. In the late 1950s British Rail (Southern Region) installed totem signage at Folkestone Junction, one version of the signs (reading Folkestone ‘Jct’) being proficiently painted over totems from Kenley (Surrey). New signs were installed when the station became Folkestone East, but the re-signing, the recent platform construction and the earlier platform extensions seemed an extravagance as the station closed on 6 September 1965. The down platform and buildings were quickly demolished, although a short section of platform was retained for railway staff at the signal box; this is still in use but the Folkestone East box is due to be abolished in 2018 with control of the area passing to the South Kent Regional Operations Centre at Ashford. The up platform building lingered until 1978 and the platform is extant. Part of the goods yard was later used by a new road called Southern Way and more recently part of the yard has been used to site of an underground pumping station for Southern Water. Various schemes for the re-use of the remaining land at Folkestone East have been proposed, from the site of a new depot, sidings for stabling and maintaining CTRL services. The site of the former goods yard was offered for sale in January 2008 and today most of the land is still awaiting development. Over the years there have been numerous proposals to reopen the station. Most recently Shepway Green Party has launched a campaign to reinstate Folkestone East, insisting it would be a major boost for the area’s regeneration plans. The scheme has been given approval by the Remembrance Line Association which is hoping to operate a tram service connecting the harbour to the town centre, partly using the old harbour branch line. The association claims that a reopened East station could regain its status as the principal station for the town because of insufficient car par parking space at Folkestone Central. Tickets from Michael Stewart. Route map drawn by Alan Young. Bradshaw from Chris Hind. Totems from Richard Furness. Click here to see a 7 minute film of a return journey from Folkestone East to Folkestone Harbouron on 14 June 2007 by Chris Fletcher . Includes a good view of the staff halt at Folkestone East. Folkestone Junction station looking east from the up platform towards Dover c1890. The staggered platforms favoured by the South Eastern Railway are seen; a footbridge was added at a later date to replace the boarded crossing between the platform ends. The west portal of Martello Tunnel can be seen in the far distance. The goods shed seen on the left has been recently built and replaced an earlier, smaller shed on the same site. 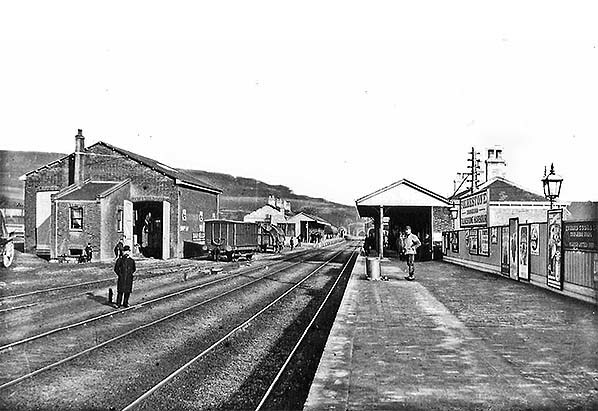 Much more extensive goods facilities were later provided behind the up platform but the early yard and the shed seen here remained in use. 1873 1:2,500 OS map shows the original layout of the station and goods yard. The staggered platforms and buildings are shown; at this time there was no footbridge, with passengers using a boarded crossing between the two platform ends. The goods yard is on the down side opposite the up platform. It comprises two sidings running parallel with the main line; one passes through a small goods shed while the other loops round it. From one of these sidings, two further sidings run diagonally across the yard towards the ‘Railway Bell’ hotel. The yard crane is sited between the sidings; in 1994 this had a capacity of 4 tons. There is a blacksmith on the left side of the yard. To the east of the goods yard there is a turnplate with with four short sidings fanning out. From the turnplate a line runs across the main line at right angles to another turnplate on the up side with two short sidings running into a carriage shed. The early railways often took a single siding into a goods yard, where a small turntable or turnplate then fed a series of sidings radiating out from it, often crossing other lines at right angles. It was common to see sidings crossing a main line by using turnplates. Goods yards were generally re-laid with points from the later nineteenth century, and generally sidings running across main lines were phased out. To the east of the carriage shed, there is an extensive range of coke ovens for producing locomotive fuel. The junction with the harbour branch is seen top right. A signal box is sited between the junction and the main line. To the left of the signal box there are two single-road engine sheds back-to-back. 1965 1:2,500 OS map shows further changes. The station is now closed and is no longer named. The down side goods yard has been closed and all the sidings have been lifted; only the goods shed remains. The signal box at the east end of the down platform has been demolished and replaced with a much larger panel box behind the down platform. The down platform has been demolished but a short section has been retained just to the east of the new box for the use of railway staff. The down side station building has been demolished. The up platform and building are still shown although the prefabricated extension at the east end of the platform has been demolished. To the south of the main line, the sidings and goods yard remain largely unchanged. The sidings on the east side of the Harbour line have been lifted. Click here for a larger map. 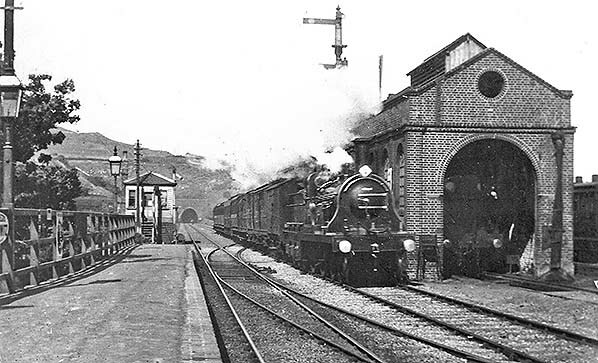 A westbound train is seen passing the two back-to-back engine sheds on the approach to the up platform at Folkestone Junction c1890s. The sheds were closed and quickly demolished when a new three-road shed was opened to the rear of the signal box. The west portal of the Martello Tunnel is seen in the distance. Folkestone Junction station looking east from the east end of the up platform c1905. Staggered platforms were favoured by the South Eastern Railway and the boarded crossing used by passengers is seen between the two platforms. The Board of Trade stated that this practice was dangerous although they still sanctioned the opening of the station. 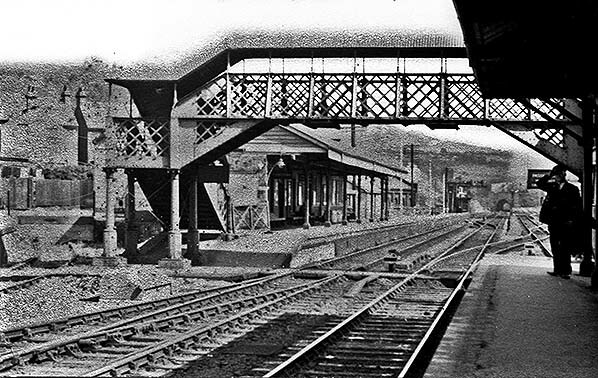 Around the turn of the twentieth century a covered footbridge was built between the two platforms. Folkestone Junction station looking east from the up platform c1930s as a local train stops to pick up passengers. The down goods yard was still in use at this time but the rail opening at the back of the goods shed appears to have been bricked up and the office seen in the 1890 picture at the rear of the building has gone. A trio of R class locomotives are lined up outside the Folkestone Junction shed c1936 ready for duty on the steeply graded Folkestone Harbour line. An express service hauled by Schools class 'Hurstpierpoint' is seen approaching Folkestone Junction station in April 1947. No.918 was built at Eastleigh works, entering service in June 1933. It was withdrawn from 70A, Nine Elms shed, during October 1961 to be scrapped a month later. All 40 of the class were named after public schools, and such was the power of the locos that BR gave them a 5P classification, the only 4-4-0 locos to receive this. Luckily, three examples have been preserved: Stowe, Repton and Cheltenham.